Home » Family » What exactly is an annulment? Paul Shogren is back with another episode of Marriage Matters, this time to explain what an annulment is and what it is not. Question: We hear the word all the time, but what exactly is an annulment? 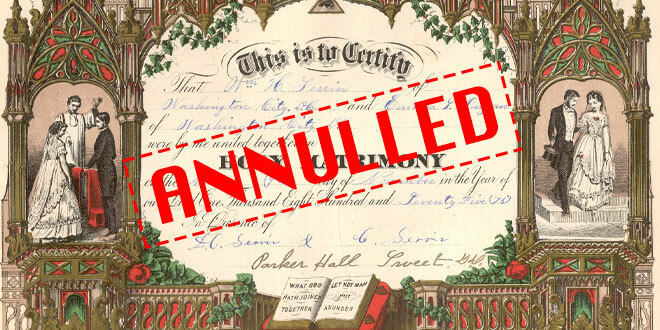 An annulment, or to use the more precise term, a declaration of nullity, is a determination by a Church Tribunal (or in certain circumstances, the diocesan bishop) that a marriage so lacked an essential ingredient that the union could not be called a ‘marriage’. Having a declaration of nullity enables a person to enter a further marriage in the Church. At a wedding we hear the bride and groom make their promises. Afterwards we congratulate them on being husband and wife. We assume that the promises they made created a bond of marriage between them. Sometimes we know that either the bride or the groom did not mean what they said with the promises. For example, they promised faithfulness but kept secret their real intention that if the opportunity arose it was okay for them to cheat on their spouse. The promises they made were empty of the binding power needed to create a marriage bond. When a church or civil tribunal issues a declaration of nullity of a marriage they are saying that the promises were empty or null. That is an annulment. Different to divorce procedures, annulment procedures look at the wedding ceremony not at the breakdown of the union. Who were the bride and groom on the wedding day? What did they mean when they promised? Were they psychologically able to make such promises? But I want to say something important about the perspective canon law takes on this investigation. Nobody is ever asked to prove that their marriage was valid – canon law presumes all marriages are valid. There is a crucially important canonical phrase that carries weight from the moment a person sets foot in the Tribunal to the moment that person receives a decision – ‘Marriage enjoys the favour of the law.’ In an annulment what has to be proven is that the marriage was null; that this union which may have looked like a marriage was never in truth a marriage. I would also make a second observation – there is an absolutely critical difference between divorce and annulment. Divorce proceedings are about what happened at the end of a marriage, the annulment process is about what happened at the beginning. In other words ground zero for us when we investigate a marriage is the moment of consent – when the two parties stood up and said to each other ‘I do’. Finally I must say what an annulment is not. It is not a decision by the Church about who was a saint and who was a sinner in a marriage and it is not an exercise in apportioning blame for the failure of a marriage. The Tribunal is not some sort of torture chamber staffed by cruel people who spend their days inventing ways to make people’s lives miserable using the Code of Canon Law.